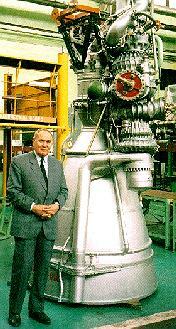 Kuznetsov LOx/Kerosene rocket engine. N-1F stage 1 (block A), Kistler stage 1, Taurus II stage 1. Modified version of original engine with multiple ignition capability. Never flown and mothballed in 1975 after the cancellation of the N1. Resurrected for Kistler, then for Taurus. AKA: 11D111;AJ26-62. Status: Mothballed 1975. Date: 1970-74. Thrust: 1,638.00 kN (368,237 lbf). Unfuelled mass: 1,222 kg (2,694 lb). Specific impulse: 331 s. Specific impulse sea level: 297 s. Burn time: 600 s. Height: 3.71 m (12.17 ft). Diameter: 1.50 m (4.90 ft). After initial failures of N1 modified engines with multiple ignition capability and increased life were developed. NK-33 was tested at thrust of up to 204 t, variations of components ratio up to 20% and total burning time up to 1200 sec. Mothballed, never flown until selected by Kistler for their commercial launch vehicle in 1996. This in turn was cancelled and it was selected for the Taurus II with first flight in 2013 - 38 years after fabrication. Aerojet was already looking to develop an alternative due to low stocks, when soured relations with Russia in 2014 threw the whole concept of using Russian engines on American launch vehicles into question. Thrust (sl): 1,510.200 kN (339,506 lbf). Thrust (sl): 154,000 kgf. Engine: 1,222 kg (2,694 lb). Chamber Pressure: 145.70 bar. Area Ratio: 27. Thrust to Weight Ratio: 136.66. Oxidizer to Fuel Ratio: 2.8. Country: Russia. Launch Vehicles: N1F, N1F Sr, N1F-L3M, Kistler K-1, Taurus II. Propellants: Lox/Kerosene. Stages: Kistler Stage 1, N1F Block A, UR-500MK-1. Agency: Kuznetsov bureau. Bibliography: 21, 351, 7453.